And make sure to check out the captivating new novel from Lynn Cullen—Twain’s End—where the acclaimed author tells a fictionalized imagining of the relationship between iconic author Mark Twain and his personal secretary, Isabel Lyon. Cullen begins Mrs. Poe with two epigraphs. In the first, Osgood is recounting her first meeting with Poe to Reverend Griswold. In the second, Poe describes Frances Osgood. How do these two quotes set up the novel? Were Cullen’s representations of Osgood and Poe as you expected after reading the epigraphs? Although Frances narrates the story, it is named for Mrs. Poe. Why do you think that Cullen has chosen to call the novel Mrs. Poe? Did the title affect your reading of the story? How? After Frances meets Virginia Poe for the first time, Eliza asks her, “What does she seem like? Sweet? Sharp?,” and Frances replies “Both, oddly enough.” (p. 55) What does she mean? Do you agree with Frances’s assessment of Virginia? Why or why not? Miss Fuller tells Frances, “Beneath that pretty society-girl surface, you strike me as the striving sort.” (p. 163). Do you agree? What reasons does Frances have to be “the striving sort”? What are your initial impressions of Frances? Did your feelings about Frances change throughout the novel? In what ways? Of Poe, Reverend Griswold says, “I find that there is nothing about Edgar Poe that is remotely like the rest of us. He is a predator, plain and simply. A wolf in wolf’s clothing.” (p. 123) Why do you think that Griswold feels such animosity towards Poe? What do you think of Griswold? Discuss his interactions with Frances. After Frances learns that Poe has praised her poetry in a lecture, the two meet to discuss writing. She tells him, “I find that the thoughts spoken between the lines are the most important part of a poem or story.” To which he replies, “as in life.” (p. 36) How does this apply to their relationship? Are there other instances in the novel where this is true? Discuss them. 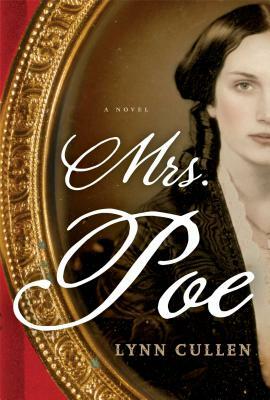 The subject of marriage comes up frequently in Mrs. Poe. Eliza tells Frances “Wedded bliss is a tale made up to keep the species going” (p. 278), and Margaret Fuller says, “for every married person [at Anne Lynch’s conversazione] there is a story of rejection and betrayal” (p. 77). Discuss the marriages in Mrs. Poe. Why do you think Eliza feels that wedded bliss is simply a story? And, why does Frances stay married to Samuel although she knows he is a philanderer? Do you think that Frances is justified in making her decision? At one of the conversaziones, Poe says, “Desire inspires us to be our very best.” (p. 169) Do you agree? In what ways, if any, do Poe and Frances improve because of their relationship? Margaret Fuller warns Frances to steer clear of the Poes, stating that Poe is “not what he seems” but rather “a poor boy much damaged from the trauma of his childhood.” (p. 193). Do you agree with her assessment of the Poes? What do you think caused her to drop the idea of running a profile of them? Do you think that Margaret is acting as Frances’s friend, as she claims? What makes you think so? Were you surprised by Samuel’s return? Although he is “maddeningly agreeable” (p. 230) with regard to Frances’s relationship with Poe, he is critical of her work. After reading one of her poems, he tells her, “There was a time when you would have made fun of a poem like this.” (p. 240). Why does Samuel’s statement bother Frances so much? What do you think of the poem that he critiques? Frances thinks that Virginia Poe is out to do her harm. What evidence supports her suspicions? Were you surprised when you found out the truth? The Poes invite Frances to attend a play called “Fashion” with them. How does the plot of the play mirror their outing? Why does Poe apologize for his wife? In several of his conversations with Frances, Poe makes references to stories that he has written, including “William Wilson” and “The Oval Portrait.”.How does Poe use these stories to communicate with Frances? Poe reads “Al Aaraaf,” the poem he wrote when he was fourteen, at the Boston Lyceum, claiming that he wanted “to see if they could tell the difference between a child’s verse and a masterpiece.” (p. 260). What do you think the real motivation behind his decision is? Do you agree with Mrs. Ellet that he called “down the wrath of the Boston circle” because it terrified him to do so (p. 271)? Why?